Celebrate the life of someone special with the sympathy photo stone, Silently We Grieve. This unique stone is made in the USA of cast stone concrete. Weatherproof and durable for all seasons. The photo is permanently fired onto a porcelain insert and is UV protected. No fading or discoloration due to the high quality processing. Very easy process. Choose a high resolution JPG photo and email the photo as an attachment to info@hearttoheartsympathygifts.com. Include your last name and order number in the email subject line. 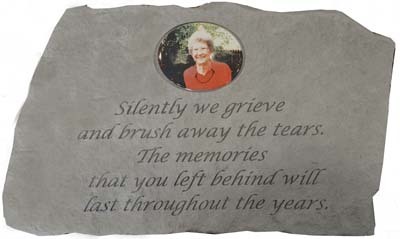 Sympathy stone measures 18" x 11"
Custom order ships within 2-4 weeks. Express your sympathy with a lasting gift of remembrance.